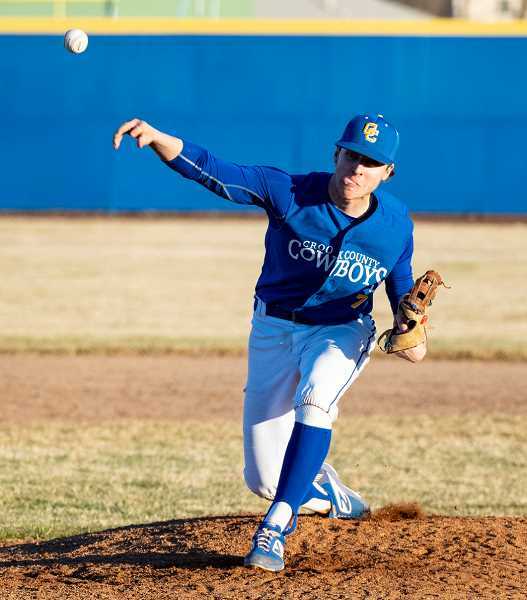 The Crook County Cowboys baseball squad is on a roll. The Cowboys have won four games in a row and six of their last seven games as they improved their record to 6-3 while winning the championship at the Madras Invitational Tournament last week. It was the second consecutive year that the Cowboys have won the Madras spring break tournament. "It was a good win for us," Crook County head coach Kramer Croisant said. "We took care of all three teams, and we played pretty well." The Cowboys cruised past Madras on Thursday, taking an 11-1 five-inning win. Friday against Taft was more of the same as Crook County rolled to an 11-3 win. Then, in Saturday's championship game, Crook County jumped on top of Junction City 4-1 in the first inning as they cruised to a 7-2 victory. "We played pretty good as a team in all the games that we played," Crook County pitcher and first baseman Garett Bernard said. "We really hit the ball well this tournament, and we limited the errors." The Cowboys ripped 12 hits and played error-free ball as they opened the tournament with an easy win over the White Buffalos. Crook County scored a run in the first inning, two in the second and one in the third as they jumped out to a 4-0 lead. Madras scored a run in the bottom half of the third to keep the game close. However, the Cowboys responded in a big way in the top of the fourth inning as they exploded for seven runs to put the game out of reach. Kyle Knudtson pitched the first four innings for the Cowboys, allowing one hit and one run while striking out seven. Diego Smith came in in the fifth inning, giving up a hit, but striking out two as he closed out the game for Crook County. Hunter Bishop went two-for-three at the plate with a double and two RBIs. Louis Duran also had two hits in the game, including a triple and three RBIs. Knudtson had a pair of hits, while Brody Connell, Bernard, Carson Smith, Diego Smith and Clayton Wilkins each had hits. Bishop and Bernard each stole a base in the game. Meanwhile, Madras had just two hits in the contest. 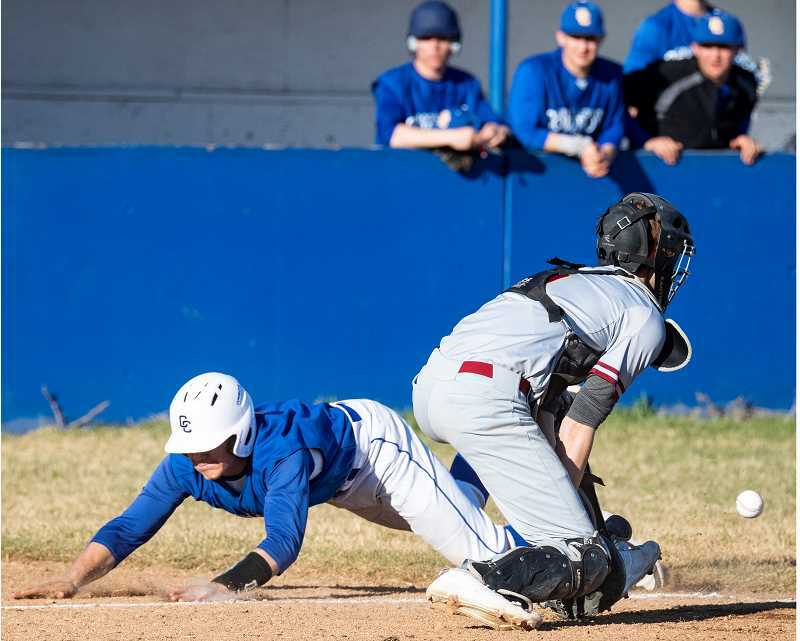 Friday in the tournament semifinals, the Cowboys took control early against Taft, scoring three runs in the top of the first and five more in the second. Crook County took advantage of walks, hit batters and errors as they jumped out to the early lead, scoring the first eight runs on just one hit. Taft tried to come back, scoring a run in the bottom of the second and two in the third. However, Crook County responded with a run in the fourth, then scored two final runs in the top of the seventh as they cruised to the easy victory. Once again, the Cowboys had 12 hits in the game, although most came after the initial barrage of runs. Wilkens went three-for-four in the game with a double and four RBIs, while Bishop was two-for-four with a double. Bernard also had a pair of hits and a double, while Ethan Cossitt, Connell, Carson Smith and Trentyn Maryanski each added hits. Connell had a pair of stolen bases in the game. Justin Smith pitched two innings for the Cowboys, giving up two hits and a run. Carson Smith pitched the next four innings, giving up five hits and two runs. Wilkens then closed out the game, not giving up a hit in his inning of work. Friday's win set up a Saturday afternoon matchup with previously unbeaten Junction City. The Tigers entered the game ranked fourth in Class 4A with a 6-0 record while averaging nearly 13 runs a contest. However, the Cowboys quickly took control, scoring four runs in the top of the first inning. Crook County added a run in the second, another in the fourth and one in the sixth, while Junction City scored a run in the bottom of the first and fourth innings. Bernard pitched the first five innings for Crook County, giving up a pair of runs on three hits, while Wilkens closed out the game with two innings of work, giving up one hit and no runs. The Cowboys were able to take advantage of Junction City errors as they were able to score seven runs on just six hits. Knudtson was two-for-three in the game with a double. Bernard also had a double, while Connell was two-for-four. Cossitt had the remaining Crook County hit. Although he didn't have a hit, Duran had a pair of stolen bases in the game. "Our defense made the difference," Bernard said. "I can always trust on those guys to stick behind me and get the out when we need to." Croisant was pleased with both the pitching and defense that he saw in the tournament. "Our pitchers are throwing strikes and our defense is playing good defense," he said. "We go to the cages and hit for about an hour before every game, and I think that helps us kind of wake up and have fast starts. It was a total team effort." The Cowboys host Silverton, 6-1, this afternoon beginning at 4:30 p.m. The Cowboys then host Mountain View, 2-2, on Friday. Both games will be played at Davidson Field as the varsity field is not yet playable. Friday's play will feature both varsity and JV action with the first game starting at 2 p.m. and game two beginning immediately after game one finishes.